It might not look like a training exercise: space engineers sitting around a meeting table, throwing down cards on a board game. But they are busily learning about the hidden environmental costs of space missions. ESA's Clean Space initiative – tasked with reducing the environmental footprints of the space industry both on Earth and in orbit – includes a dedicated 'ecodesign' element. As part of this effort, this new board game was created by the Quantis company. Terrestrial industry uses the 'life cycle assessment' method to assess the environmental impacts across a product's entire life. Now it is being harnessed for space projects, too. "The aim was to find a more effective way of communicating the concept, as opposed to paper reports or online presentations," explains Rainer Zah of Quantis. "This is an interactive game that can be played in groups, encouraging discussion and tackling the sometimes abstract issues involved in a tangible way. It's also fun!" At the start, the players are presented with a board showing a mission's complete life,from initial planning to design and manufacture of the satellite and its launcher, the launch campaign and mission operations, concluding with its end-of-life and disposal. The group is handed cards marked with differing sources of environmental impacts, such as air, road, rail or sea transport, office electricity use or material manufacturing, applying their knowledge to place these cards at the life cycle stages, or remove them entirely if they are judged irrelevant. Next, they are given a set of tokens representing the impacts themselves, spanning a trio of classes: Global Warming Potential, Resource Depletion and Human Toxicity. The players have to assign these impacts around the life cycle in turn. "At the end of the game, the board will represent the group's combined understanding and best guesses of impacts arising along a space mission's life," explains Julian Austin of Clean Space. "Then comes the moment when the group is shown the actual results – based on the detailed research we have already performed across the sector. Comparing their perceptions with the facts helps demonstrate principles in a clear and obvious way, leading in turn to brainstorming of ways to make space missions less damaging in future." 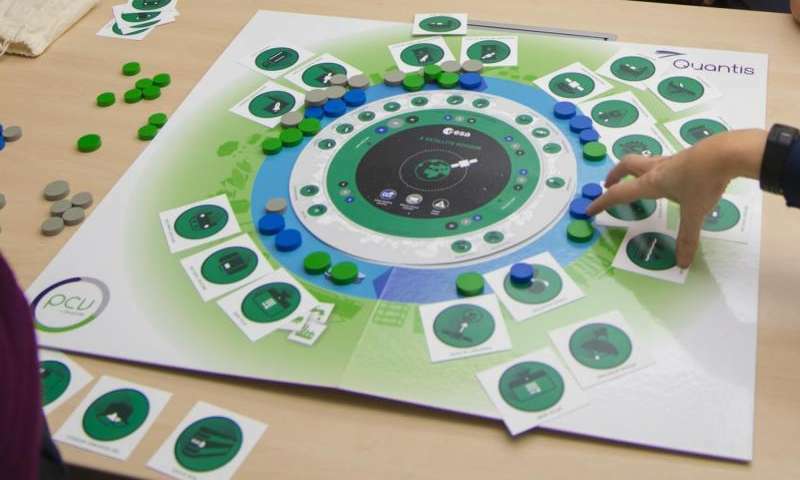 The game is being used by ESA as part of internal ecodesign training sessions, set to be extended to industry in future.